You’ve probably noticed that I don’t blog much anymore. Standard excuses apply (grandson, book, teaching, square dancing, dealing with my dad’s estate, and cataract surgery!) But, truth to tell, now that everybody’s doing it, I don’t feel as compelled. Nevertheless, sometimes things happen that just have to be blogged about. This is one of them! Bada bing! And, yes, I did fumble, grumble, and stumble, but in true Murphy Method fashion, I KEPT GOING! Casey and I are getting excited about our Beginning Banjo Camp, October 26-28. We are hoping for excellent weather—last year it snowed and we lost electricity for seven hours! Our camps are becoming known for the amount of time the students spend PLAYING THE BANJO! You will play and play and play! It will always be in a group setting so you will be surrounded by other beginning banjo players. We stick to three main tunes: Cripple Creek, Banjo in the Hollow, and Boil Them Cabbage Down. And we play VERY SLOWLY. We keep our camps small so you get lots of individual attention from Casey and me. And we do have a few more slots open [4, as of this writing]. So email Casey at themurphymethod@gmail.com if you want to join in the fun! Bonus activities: There is that concert Friday night by Casey’s new band, the Gooseneck Rockers, with Tom Adams on guitar and Marshall Wilborn (2012 IBMA Bass Player of the Year!!) on bass. They are tight! Then Saturday night Murphy’s Misfits (current crop!) will perform and then they will all join together for a “demo” jam session. We want you to see that “real” jamming can happen even at the beginner level. These are all students--just like you--who have learned to play the Murphy Method way and are now enjoying the pleasures of jamming! Posted in banjo, By Murphy, Camps and tagged fiddle, Murphy Method Banjo Camp on October 1, 2012 by Murphy Henry. We’ve spent the last two days filming a new DVD, which you all are going to be pretty excited about, I think. It’s on banjo backup for fiddle tunes, that is, banjo/fiddle duet style. Think Earl Scruggs and Paul Warren. Funnily enough, this is not the first time we’ve taped this particular video. About eight years ago Murphy got together with the great Chattanooga fiddle player Fletcher Bright and recorded almost all of a project on banjo backup for fiddle tunes, but we never released it. When last year’s Fancy Banjo Backup DVD sold so well and got such good reactions I had a hankering to go back and revisit this project and see if we could resurrect it. Red pulled the footage that they had taped way back when off of the VHS tape backup, which was apparently the only surviving copy. He burned me DVDs and I watched it through, taking copious notes. Since this was the backup copy (no telling what happened to the first camera tapes…), it had run continuously, so not only did it have all the playing and teaching, it also had Murphy and Fletcher sitting and watching the playback of what they had just played and commenting on how good they sounded! Totally cute. Although the content of that footage was great, the quality wasn’t quite up to modern-day standards, especially since it was filmed onto VHS and now everything is digital. For that reason we decided to re-record it rather than editing the older tape. We called in my great friend and most excellent fiddle player and teacher Megan Lynch, who kindly consented to drive up to Winchester from Nashville (ten hours) to film with us. In two days we got the whole project in the can, and for the most part filming went really smoothly. Before we even got started we had some banjo technical difficulties (I’ll leave those to Murphy to relate…) but once we got rolling (no pun intended there) the material went down really easily. We teach backup for four songs: "Sally Goodwin," "Turkey in the Straw," "Old Joe Clark," and "Leather Britches." Then we demonstrate (NOT teach) a few more, just to give you a chance to hear some more free-form backup (not necessarily using just the licks that we teach): "Sugar in the Gourd," "Grey Eagle," "Cherokee Shuffle," and "Paddy on the Turnpike." We’re looking at a fall release for this one, so it will be a little while before you can get your hands on it, but I think you’ll really, really like it when you do! Posted in banjo, By Casey, DVDs and tagged fiddle, fiddle backup on July 13, 2011 by Casey. Today we'll talk about what may be an unpleasant subject: PRACTICE. While some learners find it easy to play one or two or six or seven hours a day, some can't get the energy or time for 20 minutes. But it's important. I can talk from my own experience. As I get older it's harder to get up the energy to practice, but sometimes there are special events coming up that make it easy. Right now, I'm practicing mandolin and singing every day, to get ready for a CD which Christopher and I plan to record in a couple of weeks. And you know what? Practice helps, even if you've been playing a long time. I'm playing and singing a whole lot better than I could a month ago. I was pretty rusty, but now I'm getting back into shape. Is it hard for you to practice? Remember that it's a lot easier to start practicing and sound good after just a day or two off, than it is if you haven't played for a week. That by itself is a good reason to play a little every day-- you'll sound better when you play again. In fact, play every day if you can, even if it's just for 20 minutes. Or 15 minutes. Or 10 minutes. Then when you get a chance to practice for a longer time, it'll be easier to play and sound better! As I've said before in these pages, 20 minutes a day is better than 2 hours on Saturday. If you go from one weekend to another without practicing in between, it can be hard to even pick up your instrument and play! So even if your schedule is rushed, when you have a few minutes in the morning or evening, play a tune or two. Your fingers will be glad you did. Posted in banjo, By Red, General, Practice and tagged banjo, bass, fiddle, guitar, mandolin, red on January 28, 2011 by Red Henry. Friday was a good day. First, in the morning, I packed a lot of DVDs to send out for our Murphy Method telephone sale. Then, in the afternoon, we (Murphy, myself, Christopher, and Cousin David) played music at a party for some nice folks here in Winchester. People listened to us, we played lots of requests, and a good time was had by all. 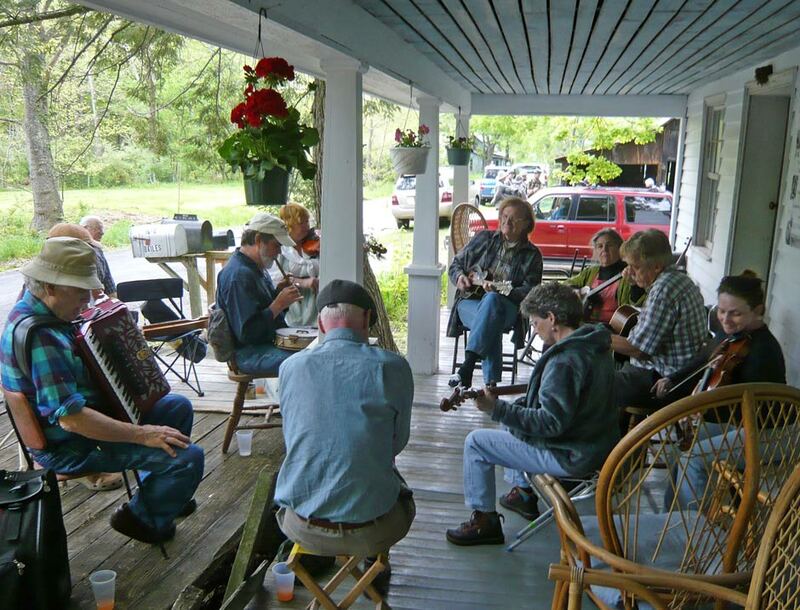 In the evening Murphy went out to square dance, but for Christopher and myself, it was time for an old-time jam at Cousin David's place, the Potato Hill Tavern. Chris and I arrived in the middle of the jam's second tune, which means that we'd only missed about 15 or 20 minutes of the jam. A tune and a half? 15 or 20 minutes? Well, you know, old-time jams are pretty different from bluegrass sessions. For one thing, everybody's playing at once, and sometimes there are a lot of "everybody." 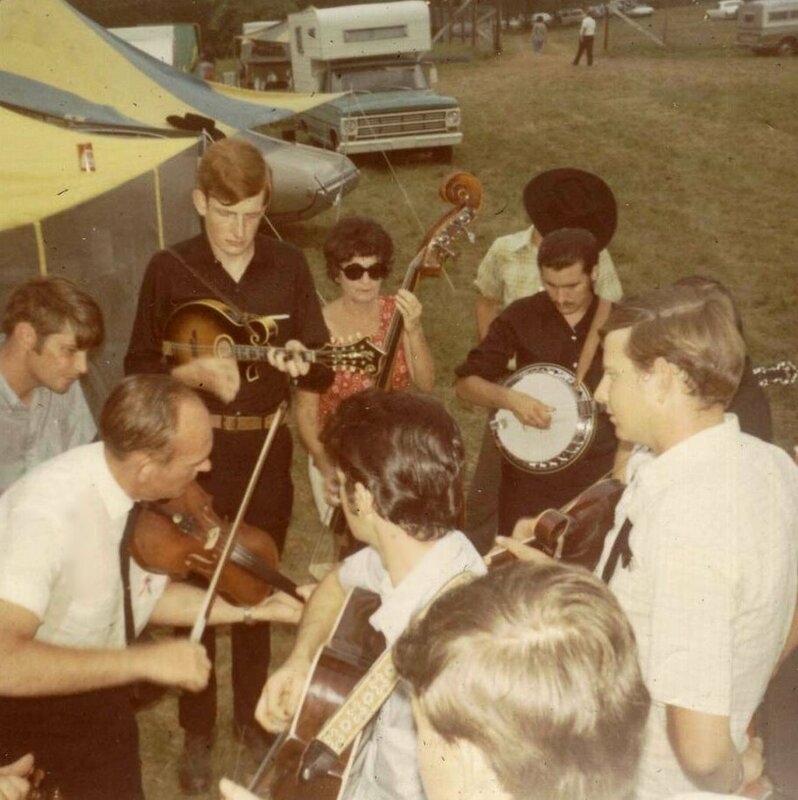 (In this case, "everybody" was 7 fiddle players, 4 banjo pickers, 4 mandolin pickers, and 3 guitar players, with people coming and going all the time.) For another thing, the old-time players really enjoy the tunes and play them for a long time, sometimes as long as 10 minutes or more. That may sound strange from a bluegrass standpoint, but it has advantages. One advantage is that if you don't know the tune (and there are hundreds of them) you can often learn it as you play, and then play it some more, for a long time, to get it into your head. Another thing is that when everybody's playing together, it creates a whole different atmosphere from a bluegrass session. Instead of the spotlight focusing on people individually (and putting pressure on every individual to play well when their time comes and everybody else is looking at them), in an old-time session everybody can just relax and PLAY. Everybody pulls together, and it's a group effort, and a strong sound. The players often take turns suggesting tunes. Whenever this session threatened to hit a slow spell, I'd suggest one of my old-time favorites, not much known in bluegrass: "Cowboy's Dream", "Old Mother Flanagan", and others. But most of the time I just sat there and played and enjoyed learning new tunes. Ten minutes at a time. It was good, and I went for about three hours before calling it a long day. If you ever have a chance to participate in an old-time session, go and have yourself a good time in a different atmosphere. It's a great chance to learn. Now, back to our Murphy Method telephone sale! I'm packing DVDs as fast as I can! Posted in banjo, By Red, jamming and tagged banjo, fiddle, guitar, jamming, mandolin on December 7, 2010 by Red Henry. Well, how often should you change them? I hear this question pretty frequently. The answer is, that it's up to you. How helpful is that? Well, the reason is that everybody's strings need changing at different times. Some reasons are because (1) there are so many kinds of strings and they age differently; (2) people all play differently and their strings wear out (or corrode) faster or slower as a result; and (3) in different parts of the country (or the world) strings are just going to need changing more often. Another sign is when the strings get hard to tune. Often it's because they're not sliding smoothly through the string-nut (that's the little white thing with slots at the bottom of the peghead). If you put on new strings, and when you're at it, put a little graphite -- pencil-lead dust will do-- in the bottoms of the little nut-slots, then the tuning should get a lot better. Another sign of elderly strings might be that they don't play in tune. If you're pretty sure that your bridge is in the right place, but your banjo is still "noting out" more than usual up the neck, then new strings might be what you need. One more sign of old strings may not be as obvious. If the instrument (banjo or otherwise) just doesn't sound right, the strings may have gotten too old to sound good at all. When does this happen? Well, this is the most extreme case of old strings, since it may take several months or a year for the strings to get this old. Some players take extreme steps to keep new strings on their instruments, especially if they break a lot of strings. Back when we were playing a lot of festivals, I used to change the strings on both mandolins and both guitars every morning before we played our first set. That was a lot of work, but it helped keep the string-breakage to a minimum. Others take a different approach. I've heard that Bill Monroe changed his mandolin strings once a year, at New Year's, and from then on just changed them as they broke (which they did, pretty often). Now, this all applies to the fretted instruments. Fiddle strings seem to fall into a different category. I've known fiddle players who changed their strings every few months, but as for myself, if the fiddle gets new strings every five years, that's a lot. I suspect that the strings on my fiddle now have been on it for longer than that! So the answer to the question is, that it's up to you yourself to decide when to change strings. There are a lot of reasons for changing them (better tone, volume, and tuning), and there are plenty of reasons for just leaving them on there (less hassle with awkward work, and less risk of getting your banjo or mandolin bridge out of place in the string-changing process, among other things). But if you go in for a lesson and your teacher takes one look at your strings and turns as green as they are, then it's time. Posted in Accessories, banjo, By Red, guitar, Uncategorized and tagged banjos, fiddle, mandolin, red on July 30, 2010 by Red Henry.